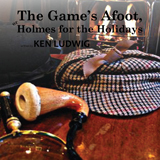 It is December, 1936, and Broadway star William Gillette, admired the world over for his leading role in the play Sherlock Holmes, has invited his fellow cast-members to his Connecticut castle for a weekend of revelry. But when one of the guests is stabbed to death, the festivities in this isolated house of tricks and mirrors quickly turn dangerous. It’s up to Gillette, himself, as he assumes the persona of his beloved Holmes, to track down the killer before the next victim appears.